Hey, look! It’s another late entry! You’d think I was running out of gas on writing these every week or something! The second half of Astro City‘s Silver Agent story came out last week, and it wraps up (or winds down?) the story of the Agent, one of the tragic figures in the city’s history, and one of the most-anticipated mysteries from the early days of the series. But I was a little disappointed, not for the reasons Greg Burgas was in that I think he doesn’t see that the Agent’s point of view is just as interesting as the man-in-the-street’s (or, at least, he doesn’t think it’s as interesting), but that it feels like it wasn’t quite worthy of all the attention and build-up. 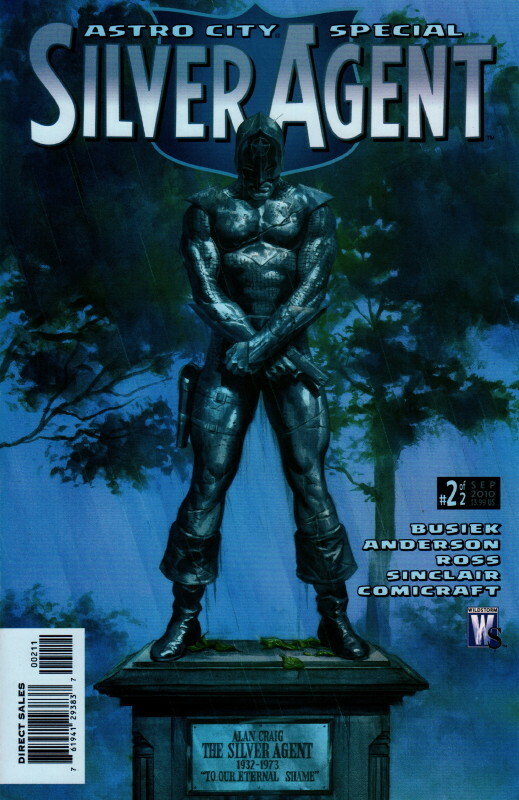 To be fair, the fact that Astro City has been on an erratic publishing schedule for a decade, and that The Dark Age initially seemed to promise to be the Agent’s story but ended up being something else, perhaps build up anticipation for the Agent’s story way beyond what it deserved. And yet. Having in the first half seen the Agent (a Captain America character) being saved by a Legion of Super-Heroes type group from the future, now we see him walking back through time to meet his eventually end in the electric chair, and excerpts of his experiences along the way, with a focus on his last two visits, with his nephew. And he does meet his end, but in a weirdly ambiguous way, which seems like it can only be satisfying if it’s the seed for further revelations about Astro City in the future, since it suggests things about the source of the Agent’s powers which aren’t really meaningful in isolation. I think what I feel is missing from this story is that the world at large felt a great deal of guilt over the Agent’s wrongful execution (which is why they erected the statue, after all), but given that this is a time travel story, I was very disappointed that there’s no interaction between him and the world in the future in which both he and they (obviously representatives of those who convicted and executed him) deal with the issue. He comes to terms with his fate, but the rest of the world doesn’t, and while maybe that’s a lost cause, the fact that this is a time travel story and there’s not even an attempt to try makes it feel like the whole story has been dramatically undermined. At his core, the Agent is a symbol to Astro City: First, a symbol of the greatness of the silver age, and later, a symbol of the shame of what the city went through in the dark age. While this story focuses on the agent as a man and not a symbol (other than as a symbol out of distant memory in the far future, which is not the same thing), a satisfying treatment of the character I think needed to address both sides, and that’s missing here. The story is itself fine, and we get a lot of tantalizing glimpses of the future of the world, but I think it went off-track in some basic way, and ended up being less than it should have been. I’m not quite sure what I think of the finale of Hercules: Twilight of a God. Though it’s refreshing in a way that the title is absolutely truthful: This is the chronicle of the last days of Hercules, in Bob Layton’s future-outer-space milieu. 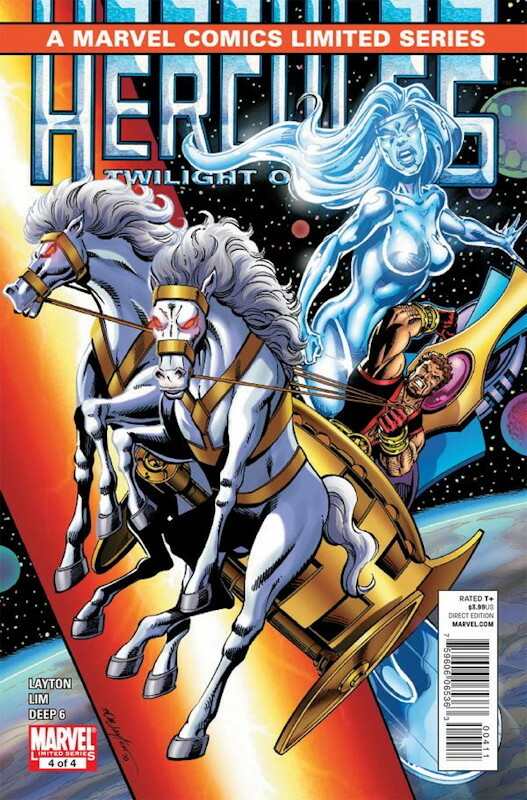 Having suffered brain damage, and with his comrades from his earlier adventures in their own old age, Herc is called on for one final task, to prevent Galactus – who is collapsing into a black hole – from destroying the galactic region where Herc has made his home and spawned a family. He completes his quest, and we see the aftermath and denouement of his adventure. While it’s a glorious end, it also feels rather anticlimactic; Hercules in his dotage is not nearly as entertaining as Hercules in his prime, and the sense of foreboding and gloom surrounding this story is just not as much fun as the earlier tales (especially the second mini-series, chronicling the fall of the Olympians, which was itself a bit gloomy yet was a much better story). So there’s stuff to like here, but… it’s not the same. And it’s also clearly the end of this series of Hercules adventures, which is in itself saddening. Ron Lim’s art is okay, but it feels stiff, and not as dynamic as Layton’s own art on the original stories. Sometimes Lim can be quite a good artist, but it feels like he phoned this one in. I’ll put this series on the shelf next to the nice hardcover copy of Herc’s earlier adventures, but it’s not really the same. Hey look, I bought something written by Mark Millar this week! I kvetch about Millar a lot. I think he’s one of the worst writers working in comics these days, and I feel no shame in kvetching because he’s also one of the most popular and successful writers in comics these days. It makes no sense to me, but, well, it’s not the only thing. My basic problem with Millar is that I think his stories are mean-spirited and un-fun, and he frequently just misses the mark in depicting existing characters. I loathed his gratuitously nasty run on The Authority, I hated his depiction of guys who happened to be wearing Avengers costumes in The Ultimates, and I hated pretty much everything about Civil War. But I was still moved to pick up Wolverine: Old Man Logan, and frankly the main reason is that I’m just a sucker for alternate-future stories. Some of them are good, some of them are bad, but I read most of them (at least featuring characters I’m familiar with) because I just like the genre. The premise of this one is so simple you can almost see Millar thinking it up: One day all the super-villains team up to take down all the super-heroes, and the ringleaders divide up the United States among themselves. Naturally, a few heroes survive, and 50 years later, Wolverine is living outside Sacramento, an old man who refuses to fight anymore, having been broken in the villain attack. But when the Hulk gang demands their rent, he hooks up with Hawkeye to drive across the country to deliver a package in Washington. So the story is mostly a travelogue in which we see what happened to the heroes and the country, and learn what happened to Logan. Considering my biggest problem with Millar is usually that he can’t get characterizations right, he nails Wolverine here, as a broken yet still strong-minded man. The story wouldn’t work at all if he hadn’t made Wolverine work. On the other hand, the story is thin, little more than a reworking of films like Unforgiven, with the Marvel Universe future-travelogue stuff thrown in. Indeed, almost everywhere you look in Old Man Logan you can see bits that feel lifted from other stories: The Hulk as a tyrant whose creed is that he survives when the weak die (from Peter David’s excellent Hulk: Future Imperfect), Hawkeye being blind (from another David yarn, The Last Avengers Story), the Red Skull’s trophy room (also from Future Imperfect), and one of the signature spreads of art in the story, that of a gargantuan skeleton of Goliath lying outside a city, feels like it came right out of Warren Ellis’ Planetary. A lot of what would otherwise be “the neat stuff” has been done before. Besides that, the story is decent enough. My biggest gripe in terms of characters is the notion that the Hulk would mate with his cousin, the She-Hulk, and produce a clan of hillbilly enforcers. This so runs against the grain of Bruce Banner and Jennifer Walters’ characters that although the final visuals are cute (Steve McNiven draws some ugly-looking redneck Hulklings) it seems gratuitous and implausible. And while the story’s climax is cathartic, it doesn’t really work if you think about it, either. McNiven is a terrific artist – he was certainly the best part of Civil War – and there’s really nothing to complain about in any aspect of his work. While his style has echoes of John Cassaday and Gary Frank, I’d say he’s better than either of them, with more intricate designs than Cassaday, a better sense of anatomy than Frank, and more dynamic layouts and figures than either of them. Unfortunately he seems to be a bit too slow of an artist to maintain a monthly schedule, because he has all the tools to be one of the greatest comics artists of his generation. 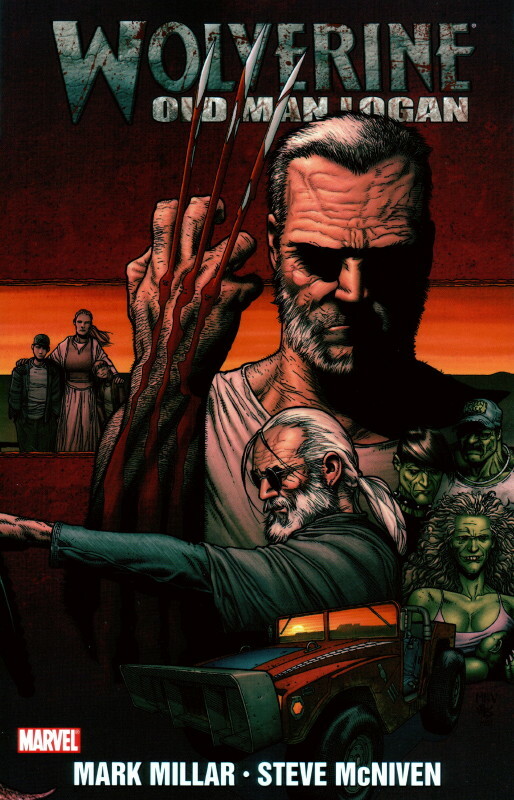 So all-in-all Old Man Logan may be the best Millar story I’ve read, but it’s still merely okay. At least it’s not downright repugnant like other stuff I’ve read by him, so maybe this is the first of several steps forward. 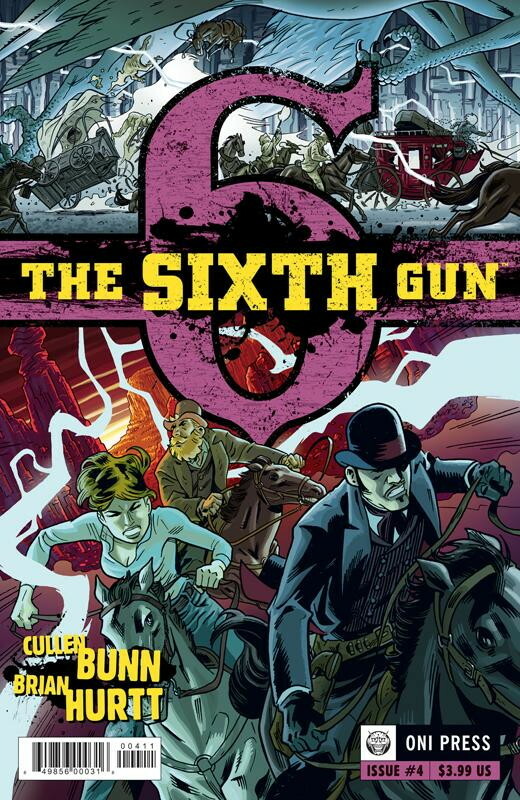 Is The Sixth Gun the best comic being published today? That’s high praise, and frankly it’s hard to make a firm decision, but wow, it’s awfully good. This Old West supernatural horror adventure (that’s a mouthful!) involves a Confederate general who – we learn in this issue – somehow got hold of six enchanted handguns for himself and his five henchmen. One of his posse, Sinclair, decided this was too much for him and bolted, managing to escape the General’s revenge. At some later point the General was defeated and imprisoned, having somehow become immensely powerful in the meantime. Now he’s back and he’s looking for his gun, now in the possession of Becky, the daughter of the reverend who apparently took down the General. The comic’s full of foreboding, supernatural conflict, and mystical beings hanging out in the Old West, and features a pair of strong female characters in Becky (coming to grips with the position she’s been put in) and the General’s wife, who matches her husband in ambition and spirit. The backstory is being revealed slowly – but not so slowly as to be frustrating – and it’s not yet clear exactly what stakes are being played for (just how powerful will the General be once he recovers from his imprisonment and if he gets his gun back?). But just four issues in The Sixth Gun has covered more ground than many comics today cover in a dozen (I’m looking at you RASL). And Brian Hurtt’s artwork is terrific, cartoony in the sense that Charles Addams’ work was cartoony, but still dramatic and menacing. His style might not translate into mainstream superhero comics (where he’d surely earn a lot more money), but it’s perfect here. The only downside is that I don’t know if this is a mini-series or an ongoing series. The story doesn’t feel like it’s poised to end in a couple of issues, but you never know. Nevertheless, this series is a lot of fun: Go buy it.